Modern laptop does not differ in performance from fixed personal computers. But the laptop is more prone to overheating and excessive noise, so you should understand why this happens. Due to the fact that the laptop is compact and mobile, the devices inside it are much smaller than in the usual stationary PC, so air circulation inside the laptop is broken. That is what most often is the cause of the hot temperature of the device. In order to reduce it, you need to regularly monitor the cleanliness of the cooling system of the laptop and check the thermal paste as needed to reduce the temperature of the processor. Noise sources laptop may be several. First, it's the same cooling system. So she worked quietly and efficiently, it must be cleaned regularly, at least 1 time per quarter. Increased noise may come from hard drive, CD drive, graphics card. If the cooling system is clean, tested, and the noise is, it's likely that you will have to carry the laptop in a specialized service center. The price of cooling pads can vary from 300 to 5,000 rubles, depending on the capacity and additional functionality. In addition to cleaning of the cooling system and change thermal paste, the laptop as little as possible to carry from place to place. Even if it is portable equipment, but the quality is not always conducive to changing operating conditions. If the laptop itself is prone to noise, it is not always a defect in the equipment. The fact that some laptops increased power is very demanding on the cooling system, so it may often make noise. In order to reduce the temperature of the laptop and reduce the load on the cooling system, you need to purchase a special cooling pad, wuauuu cooled air at the bottom of the laptop. If the money to buy it do not, you can slightly tilt the laptop by substituting one edge of either the book or something that can be fixed. This will provide the necessary air circulation at the bottom of the laptop. 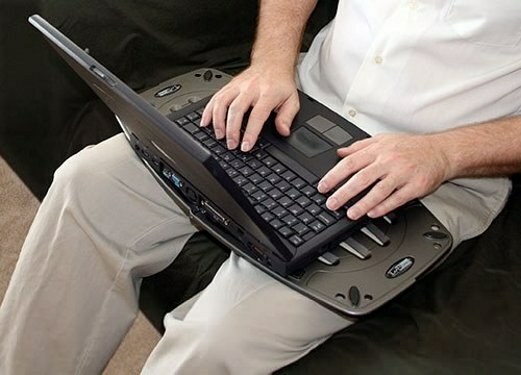 Advanced users often do design the cooling system for notebook from old fans. However, in case of failure, the system may damage the USB outputs of the laptop, which will lead to denial of warranty. To ensure quiet operation of the laptop, you need to ask the seller to turn it on and run some program that will make it hard to work and, consequently, warm. If the noise of ventilation suit the buyer, he can buy it. If the laptop has a powerful, game model, then there will have to find a compromise, as too quiet ventilation means insufficient cooling of the laptop which can lead to premature breakdowns. In other words, the sources of noise from the laptop will be much more.